Our customers have voted us the number one touring caravan insurance specialist for service and value on leading independent review website ReviewCentre.com. Our policy is rated 5 Star for cover by independent financial research experts Defaqto. Protect your caravan against accidental damage, theft, storm, fire and flood today with reassurance of a policy backed by a leading UK insurer, RSA. All with up to 50% in discounts for careful caravan owners. Caravan Guard can offer two types of caravan insurance, if you are looking for static caravan insurance, please click here for more information. As a Caravan Guard caravan insurance policy customer, make sure you get all the discounts you deserve. Caravan Guard offer low prices to reward our careful owners. Caravan Guard give you friendly expert advice from our Yorkshire based team. Our award winning training programme for advisers ensures you receive great customer service. Caravan Guard's 5 Star rated tourer insurance policy comes with the reassurance of extensive cover backed by a leading UK insurance provider, (Royal & Sun Alliance Insurance plc). You can tailor your levels of cover with options to suit your caravanning needs. This website provides a brief summary of the policy cover and options that are available to you. Your schedule will confirm cover features and levels applying. Benefits and discounts are subject to change and are subject to terms and conditions, cover level and underwriting criteria. Minimum premiums apply. For more information on this insurance policy, you can download a specimen policy or policy summary from our tourer insurance documents section. New for old option available on fifth wheelers up to 5 years old only, and the alarm, axle wheel lock, anti-snaking device, security marking, tyre safety and reversing aid discounts do not apply to fifth wheelers. We were unfortunate recently to have our porch awning damaged beyond economical repair. We decided to place a claim against our insurance to have it replaced. We contacted the claims dept on 19th May at about 09:30 am. We provided the information requested, and we were advised that we would be contacted within 24/48 hrs. On the 20th at 10am or thereabouts we had the word that the claim was approved. By 3pm, we had our replacement awning ready for our next trip out. That can only be classed as PLATINUM standard service. The claims handler Cheryl was extremely professional when dealing with our claim, taking us through the process effortlessly. We are now in our fourth year with CG it's our first claim but be sure we will always recommend them when ever we can. Why is having insurance for your caravan a good idea? A specialist insurance policy for your touring caravan ensures that in the event of the caravan being badly damaged or stolen you aren't left out of pocket. What's covered? 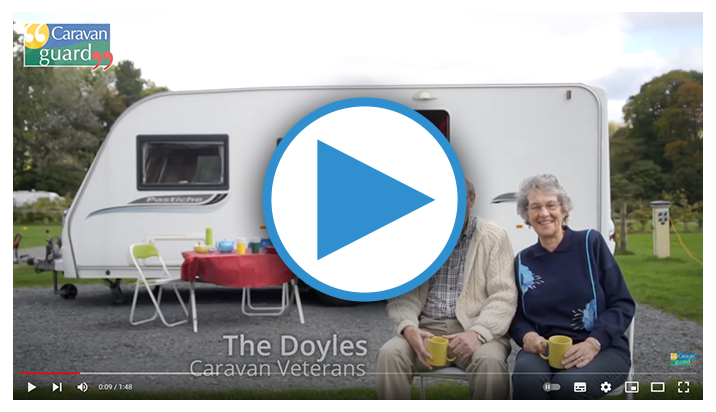 Our policy covers you for damage to the caravan itself, plus fixed kitchen equipment such as fridges, freezers and cookers, as well as 'Caravan Equipment' which includes things such as Aquarolls and security devices, and any items which are used solely in the caravan, such as televisions or radios. Removable items such as clothes and toys are known as 'Personal Posessions' and are often covered by your household policy. These can be covered on our caravan insurance policy but be sure to check with your home contents insurer first to avoid paying for the same cover twice. High risk items such as laptops, tablets, e-readers, MP3 players, fishing equipment, and pedal or electric cycles cannot be covered on this policy. However, we can insure such items on our exclusive gadget and leisure equipment policy. 'New for Old' cover means that if your caravan is stolen or damaged beyond economic repair you will be provided a brand new caravan of the same or equivalent specification. Our policy offers replacement with new cover for caravans up to 15 years old. Discounts are offered to customers who join a camping or caravan club or read a caravanning magazine. Plus we offer excellent caravan security discounts for satellite tracking devices, alarms, axle wheel locks and secure storage sites. Does my car insurance policy cover my caravan? In the event of a road accident whilst towing your caravan which is your fault, your car insurance policy only covers you for damage sustained to a third party, it does not cover any damage sustained to your caravan. Also your caravan is just as likely to be damaged or stolen when detached from your towing vehicle - and in this instance there is absolutely no cover provided by a car insurance policy. The discount applies for all members of national, regional or owners' clubs. It also applies to readers of leading caravan magazines such as Practical Caravan, Caravan Magazine and Discover Touring as well as Caravan Guard Facebook fans, CaravannersRus members, CSMA Club members, customers of our partner dealers and holiday parks and various online caravanning forums such as UK Campsite and Caravan Talk. We reward mature caravan owners with up to 10% discount. It is possible to protect a 3 year no claim discount. Don't miss out! An introductory discount may be available if you have previous experience of towing or driving a larger vehicle (even if it wasn't insured in your name). Such devices can help locate your stolen caravan by guiding police to its position using GPS, GSM or VHF technology. Not all tracking devices qualify for our discount. Please see our list of approved touring caravan tracking devices. An axle wheel lock attaches to the caravan chassis. Once the wheel is jacked up and lined up with the chassis receiver, a locking plate is fitted through the wheel to lock it in place. Examples of axle wheel locks include the AL-KO Secure or BPW/SAS/Winterhoff Diamond Wheel Lock. We accept these devices in place of a traditional wheel clamp and you will also qualify for an additional insurance discount. If your caravan already has an alarm or you plan to fit an alarm you can claim another insurance discount. There are many alarm systems available for caravans. The best types of alarm monitor movement inside the caravan using Passive Infra-Red (PIR) sensors and/or will trigger via tilt sensors if a thief attempts to tow your caravan away. The security in place at the location where your caravan will be stored could reduce the price you pay for your insurance. Having gates that you keep locked at all times or a security drive post at your home storage location will generally mean you will receive a cheaper insurance quote for your caravan. Or if you plan to store you caravan in a secure storage facility look for sites which have security features such as 24 hour access control, perimeter fencing, CCTV, and onsite wardens in place for a possible insurance discount. We reward owners that keep their caravans in a CaSSOA Gold or Silver approved secure storage site. Electronic trailer control systems such as 'Al-Ko ATC' or 'BPW iDC' work in a similar way to ESP in cars by braking the caravan's wheels if it senses loss of control. This helps to prevent snaking and keep the caravan under control during extreme driving conditions, such as hard braking or swerving to avoid an accident. Some new caravans have a system fitted as standard. It can also be retro fitted to some caravan chassis. We offer an insurance discount for VIN Chip Plus where it is fitted in addition to the basic Vin Chip kit found as standard on all UK caravans from 2016 onwards. VIN Chip Plus provides an additional electronic RFID chip, microdot solution, UV marker and additional tamper resistant labels all coded with a caravan's unique VIN number. The kit makes it even harder for thieves to hide a caravan's true identity or helps police make contact with its legal owner following theft. Please Note: This discount is not available in combination with the discount for other security marking products. *CRiS Extra/Plus must be in addition to any standard 17 digit CRiS window and chassis markings found on UK caravans since 1992 and standard CRiS tag / chip found on UK caravans since 1998. Window stickers are usually provided by the product manufacturers to warn thieves that the caravan is fitted with additional security marking. Please note this discount is not available in combination with the discount for VIN Chip Plus. Please Note: This discount is not available in combination with the discount for VIN Chip Plus. Incorrectly inflated caravan tyres can affect the way a caravan tows and may lead to a serious accident. That's why we offer an insurance discount for tyre pressure monitoring systems (TPMS) fitted to caravan tyres. TPMS systems work by placing sensors either on the caravan tyre valves or inside the caravan wheels. These sensors continuously measure the pressure and temperature of the tyres and transmit information wirelessly to a monitor inside the tow car and sound an alarm if there's any abnormality. Popular makes include TyrePal or Snooper's Tyre Pilot. We don't give insurance discounts for TPMS systems fitted to the tyres of tow vehicles. We offer a caravan insurance discount for pre-puncture tyre sealant or slime, which is a proactive defence against tyre punctures and can help prevent an accident when towing. It's injected through the caravan tyre valves and coats the inside of the tyres. In the event of a puncture, and when the penetrating object is removed, a small amount of tyre sealant is squeezed through the puncture hole to seal the tyre. We offer this discount for the likes of Phantom Tyre Protector and Ultra Seal. Please note the discount does not apply for post-puncture tyre sealant kits which are only used to temporarily repair tyres following a puncture. We offer an insurance discount for caravans fitted with rear view cameras or reversing sensors, as they can help to prevent manoeuvring accidents. Please Note: We do not offer discount on your insurance for reversing aid(s) fitted only to the towing vehicle. Reversing sensors (often slightly cheaper than cameras) are usually inserted or stuck onto a caravan's rear panel. They use ultrasonic technology to emit a series of audible beeps inside the towcar, which sound closer together as the caravan moves towards to an object. Please Note: We do not offer caravan insurance discounts for reversing aid(s) fitted only to the towing vehicle. Moran Motorhomes Ltd is an Introducer Appointed Representative to Caravan Guard Limited.Caravan Guard Limited is authorised and regulated by the Financial Conduct Authority. Cover only available to UK residents (including Northern Ireland). Calls may be recorded.